Colchester United manager John McGreal lavished praise on his players for their ‘terrific performance’ during Saturday’s crushing 4-0 victory over Northampton. After withstanding a strong start by the Cobblers, Frank Nouble nudged United in front on 25 minutes before the visitors ran riot in the second-half, scoring three times in 15 minutes either side of the hour-mark. 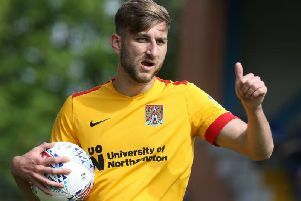 Substitute Abobaker Eisa powered in a second, Kane Vincent-Young found the corner for a third and then the impressive Sammie Szmodics converted Brennan Dickenson’s low cross to rub salt into Northampton wounds, and there was still time for Harry Pell to miss a late penalty. “It was a terrific performance,” said McGreal, whose side remain a place outside the play-offs in League Two. “You think of the players they’ve brought into the team - the Sordells, the O’Tooles and others like that - they’ve got good experience and good personnel around the pitch. “We had to defend well before we scored with corners and crosses coming into our box and other things we’ve been working on and that was a pleasing aspect because it gave us a platform. “The first goal was important. We always look like we’re going to score and it was a terrific ball in from another set-piece. “The goal got us going and the boys started playing some good, counter-attacking football. The pace when we went through the thirds was a joy to watch from a young, dynamic footballing team. I was really proud of them. “We needed the save by Rene Gilmartin before our second goal. It was a brilliant save and he’s done that for us on a number of occasions and those are the fine margins.